Foundations can be compromised by many variables. Some factors include soil type, building load, and the environment. Regardless of the cause, Matthews Wall Anchor can assess the issue. We repair commercial foundations, including mat foundations for businesses in the Pittsburgh, PA area. What is a mat foundation? 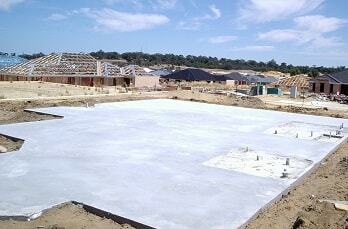 A mat foundation is a shallow concrete foundation that sits on or just below the ground. Builders also refer to it as a slab foundation. Mat foundations are usually applied to light, pre-engineered buildings with flexible walls and rigid frames. They can be used on poor soil conditions that have a uniform consistency. For proper installation, the mat structure needs to be more rigid and thicker than spread footing. A mat foundation can be used for large loads, low soil pressure, or for structure walls that are so close that individual footings would overlap. For mat foundations in Pittsburgh, PA, contact Matthews Wall Anchor today. We can assist you with all your commercial foundation needs.